I have not mentioned recently enough how bizarre your world is to me. I need to ask. Cow abductions? What on earth? Why would they want cows? I think that the point is that they’re being abducted by ones who are not from Earth. This entry was posted in fluffy and tagged conspiracies, Fluffy on November 30, 2013 by Webmaster. I know it’s a bit “late” to be posting things I’m thankful for, but you know what? Who cares! Thankfulness should happen every day, not just on days designated for it. Today, I’m particularly thankful to be home still, and to be able to flop on my nice bed. As I mentioned, where I am for most of the year this year, I have a top bunk. I’m currently back at home, with my family. I don’t have a top bunk there. That means I get to flop on my bed after a long day standing. It’s really nice. So, what are you thankful for this Friday? This entry was posted in real world, Webmaster and tagged real world, webmaster on November 29, 2013 by Webmaster. Reasons to be thankful you’re having your Thanksgiving Dinner! 1) This substance somewhat related to banana pudding. 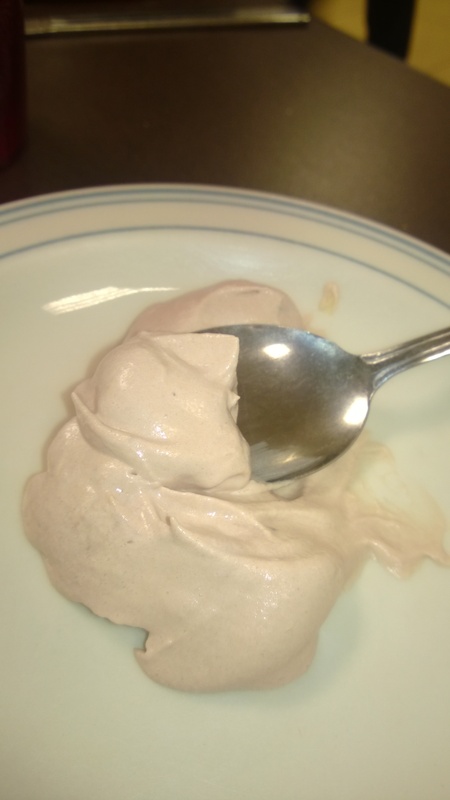 It tasted weird, and its consistency was definitely odd. If there hadn’t been cake in it, it wouldn’t have been a problem. In fact, it might even have tasted ok. The chocolatey stuff, though, really made it less than wonderful. A small portion that I got. You can tell that it actually wasn’t bad because there was a time when there wasn’t much in the container. It was definitely too sweet. 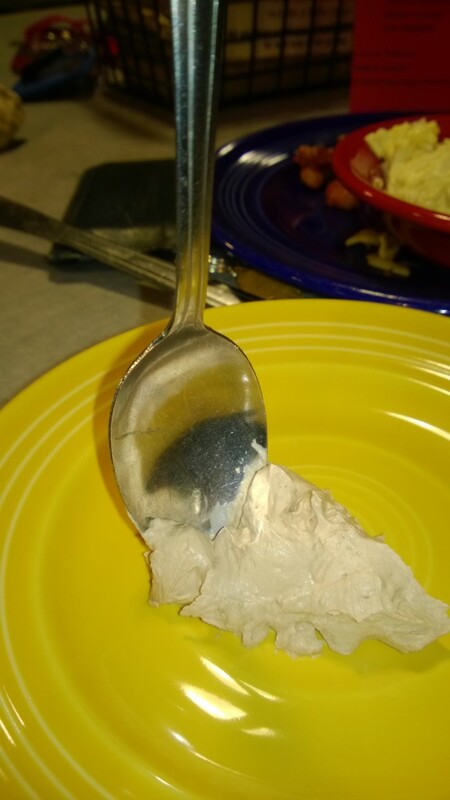 But it had a nice, creamy consistency! It’s not pumpkin pie, or turkey and stuffing, though, so your thanksgiving will almost definitely be better. 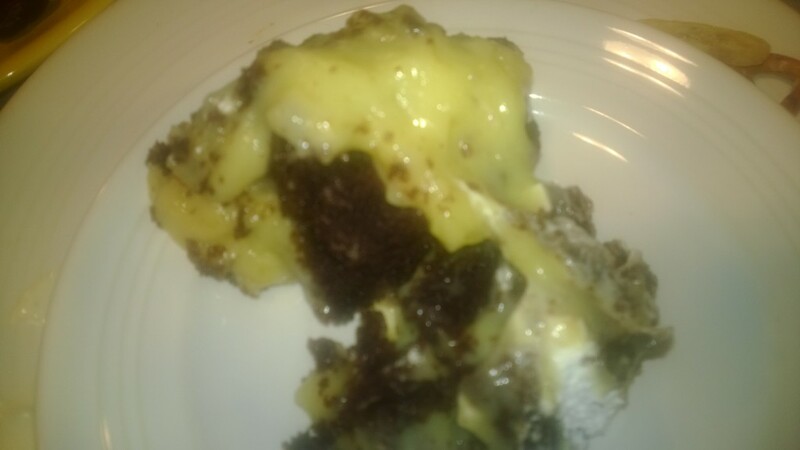 3) This “bread pudding”. When I showed my picture to my parents, their first thought was that it looked like Egg Foo Young. 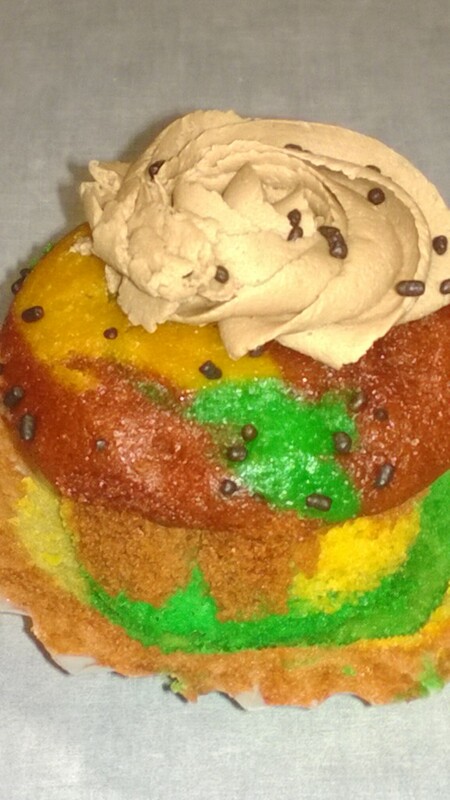 5) This odd colored muffin with frosting. At least, I think that’s what it was. 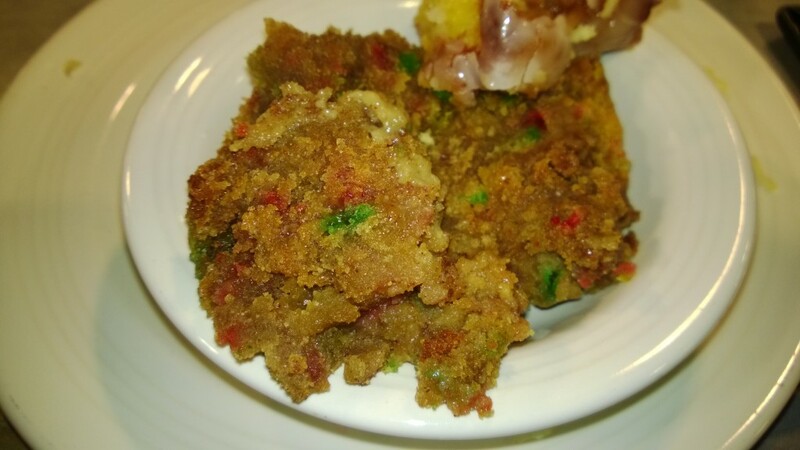 On the one hand, it’s multicolored and slightly grainier, thus indicating that it’s a muffin. On the other hand, it’s frosted. 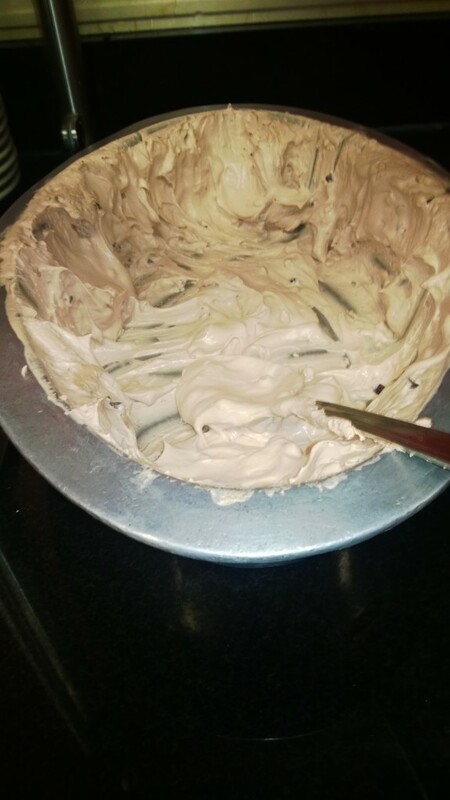 Frosting implies cupcake. 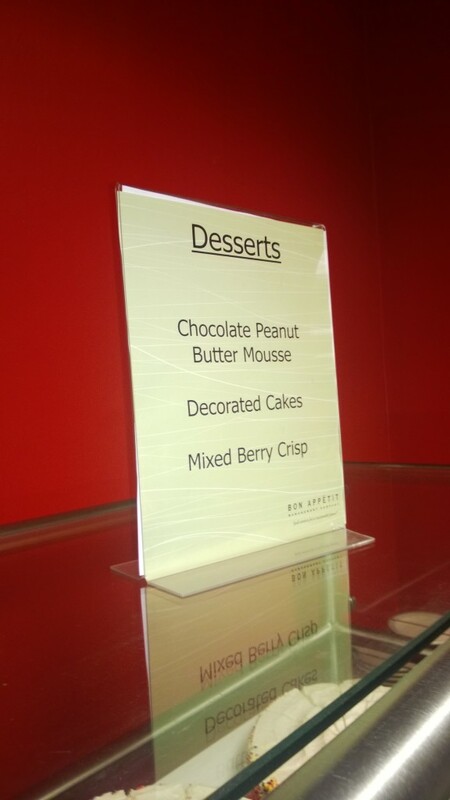 So is it a mupcake? I have no clue. 6) This brightly colored orange… dish. The badness of the quality came naturally to me. I’ve got SKILLS! 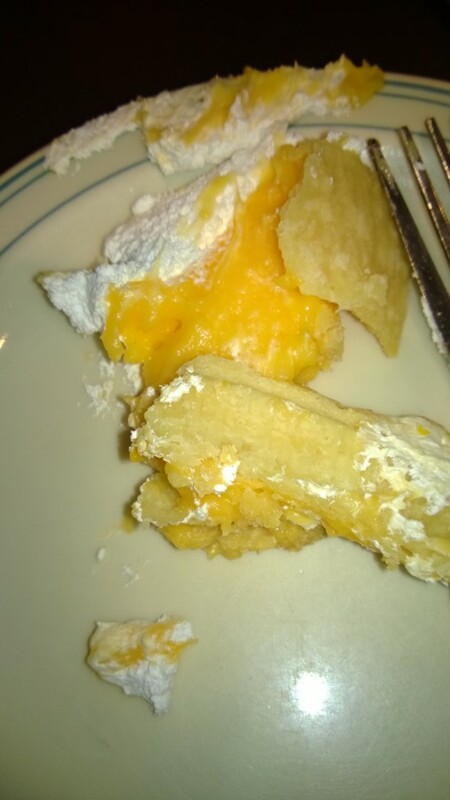 It tasted like dreamsicle in pie form. Not bad, but, again, weird. And, again, oddly colored. I was very surprised that I actually liked it! 4) Even MORE fluff stuff! how many kinds of fluff ARE there? So, yup. Several reasons to be thankful you have your thanksgiving dinner! I hope you have a great one! This entry was posted in food, list, real world, Webmaster and tagged fluff, food, list, real world, webmaster on November 28, 2013 by Webmaster. 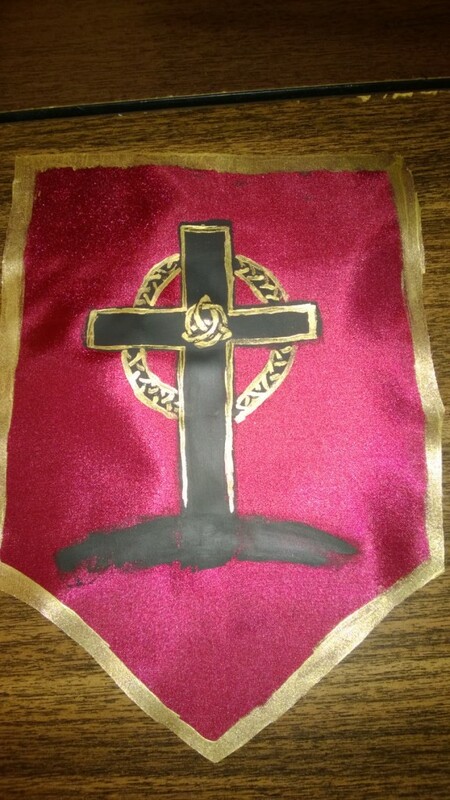 The first thing that I made yesterday was a painted miniature banner. I really liked the gold paint on the blue. A small piece of fabric. 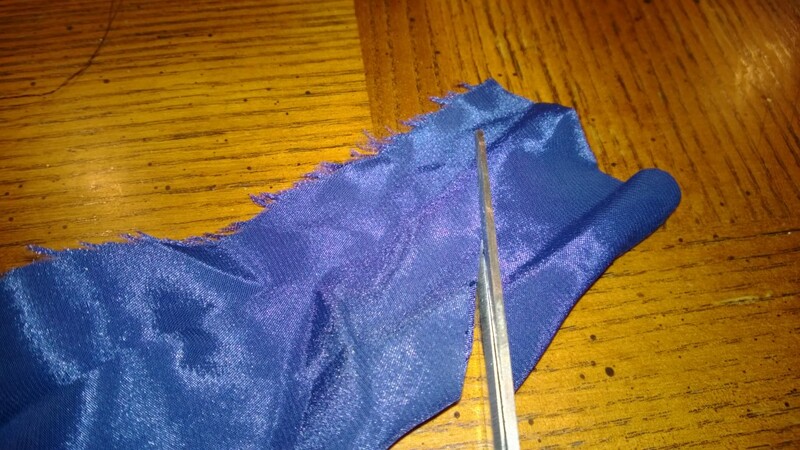 1) Cut a piece of fabric. I first trimmed it down to approximately a reasonable size. I think it was about 6×8 inches, but I’m not entirely sure. This is really flexible, though, and only depends on how large you want your banner to be. Whatever size you’re making it, don’t forget that you’re going to need to leave room for hemming. 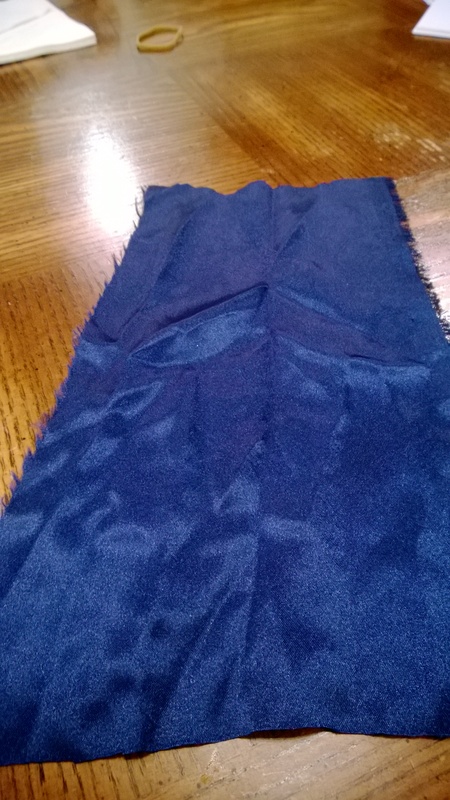 Unless you found a fabric that doesn’t fray, like I did with my red banner from yesterday. 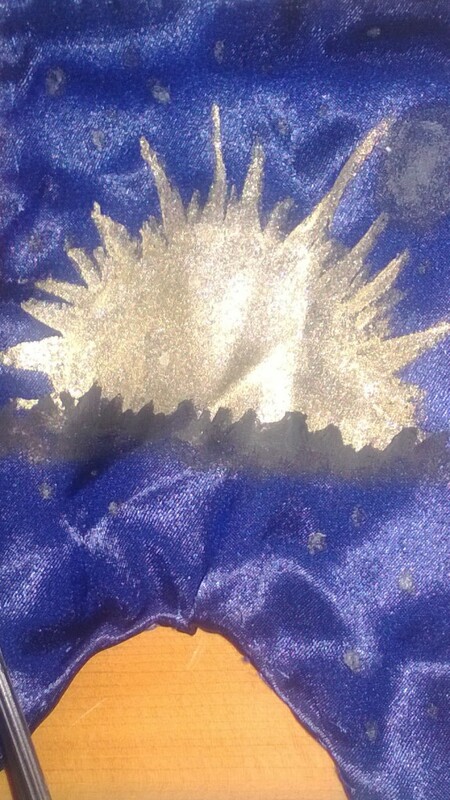 However, since this is for a sewn and painted banner, I’m going to assume the fabric frays. 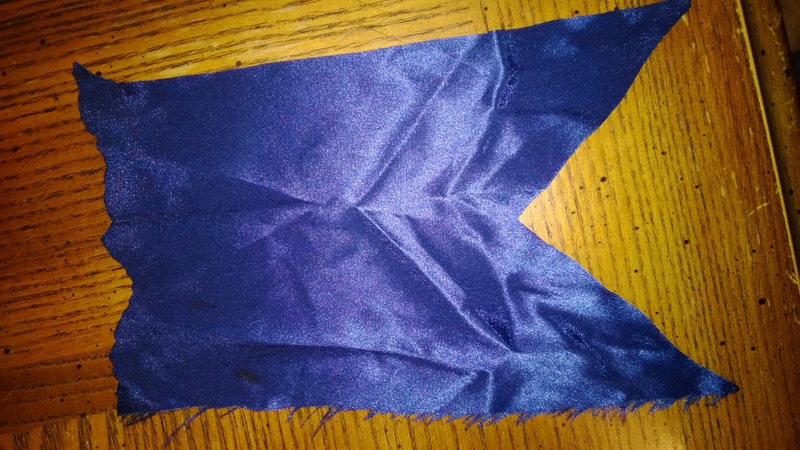 Cutting the fabric into a banner shape. Note: I didn’t iron this fabric before cutting. That was a mistake. Take the time and get the wrinkles out! It helps a lot with painting later on. 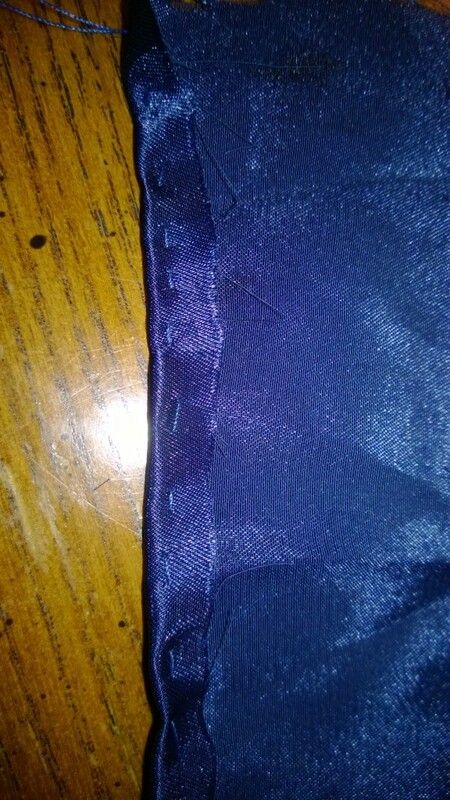 I also don’t show it here, but after this, I evened out the top edge slightly, even before stitching. Stitching only a single fold in. As I’m sure you’re aware, fold towards the wrong side of the fabric, if you have fabric with a right / wrong side. Also, be sure to fold consistently towards one side. Nobody makes a banner to see the folded edges- that’s just silly. 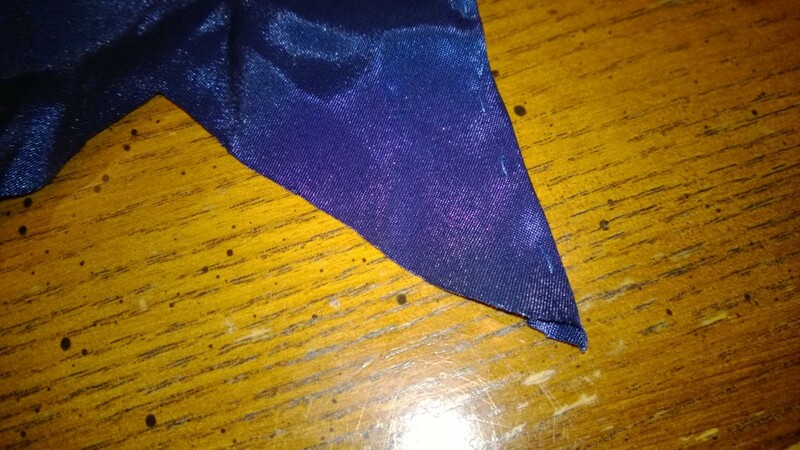 4) Make it into a hem. 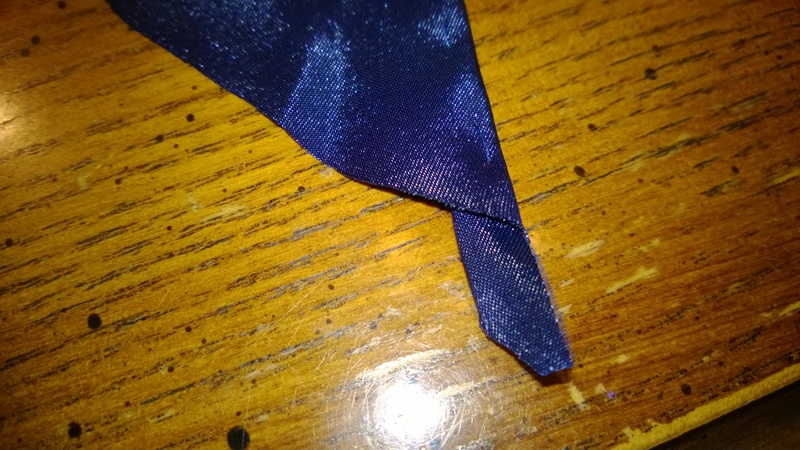 What I personally did was I got one edge hemmed before moving onto the next edge. 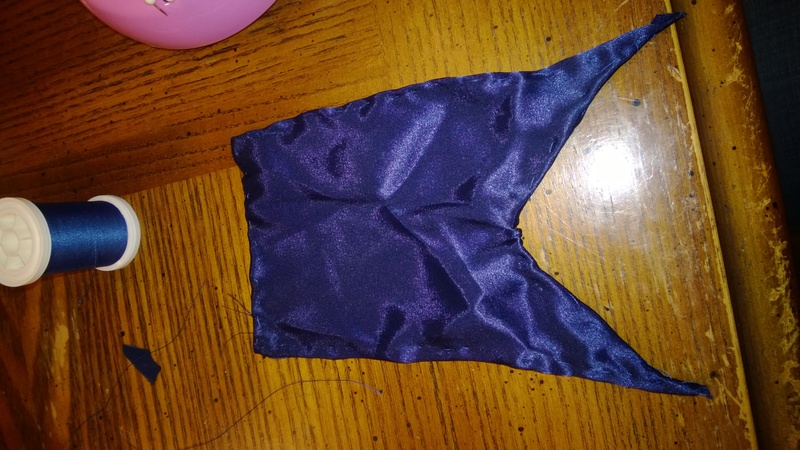 Looking back on it, it might make more sense to make a first pass on all the edges, and then convert them all to actual hems. If you try that, let me know how it works? But anyway. For those who don’t know how to do that, basically just take your edge and fold it over (towards the same side) again. The point is to hide the unfinished edge so that it won’t fray. 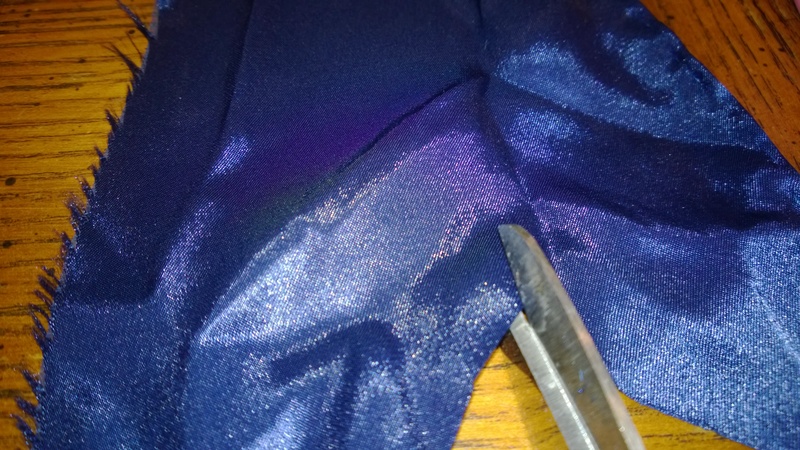 This is especially important with fabric like the type I was using that frays waaaay too quickly. As you hem, it should look something like the photo above. Do this for all of your straight edges. Add the slit to your banner to allow for tighter corners. 6) Trim extra. 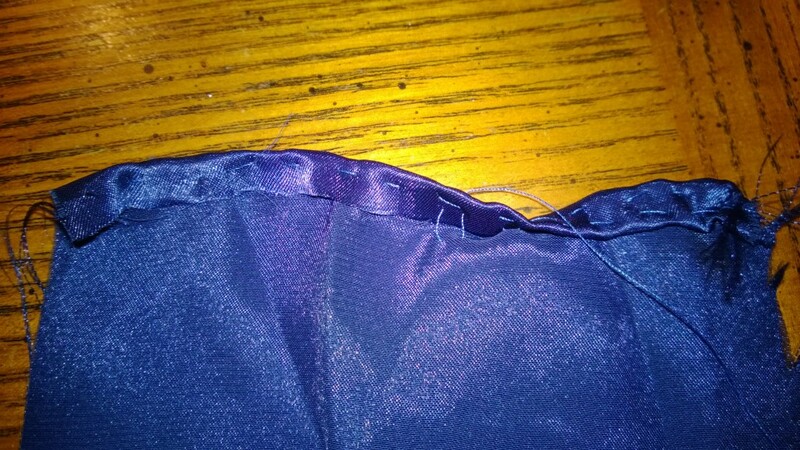 When you’re done rolling / hemming the angled parts, you’re going to get a few awkward parts hanging off the end. Just trim that part, to make it even with the rest of that part of the banner. 7) You’re done with the stitching! Now, on to painting! Finished stitching! Paint, and you’re done! As I mentioned, I just used craft paints of various sorts. I ended up freehanding everything. That’s primarily because I don’t own any decent stencils of any sort. Painting is completely up to you. The key thing to remember is to have fun! This is probably one of the cheapest crafts you can do, since in theory you’re only using leftover scraps. So yes, you’re paying for paint. But you don’t need that much for the motifs. In all, it’s fairly inexpensive. Happy Wednesday! And happy crafting! This entry was posted in crafts and projects, real world, Webmaster and tagged crafts, crafts and projects, real world, tutorials, webmaster on November 27, 2013 by Webmaster. That being said, I owe you some slightly longer posts. In fact, I owe you some specific posts. This entry was posted in crafts and projects, ooh shiny, real world, Webmaster and tagged arts and crafts, crafts, crafts and projects, real world, webmaster on November 26, 2013 by Webmaster. 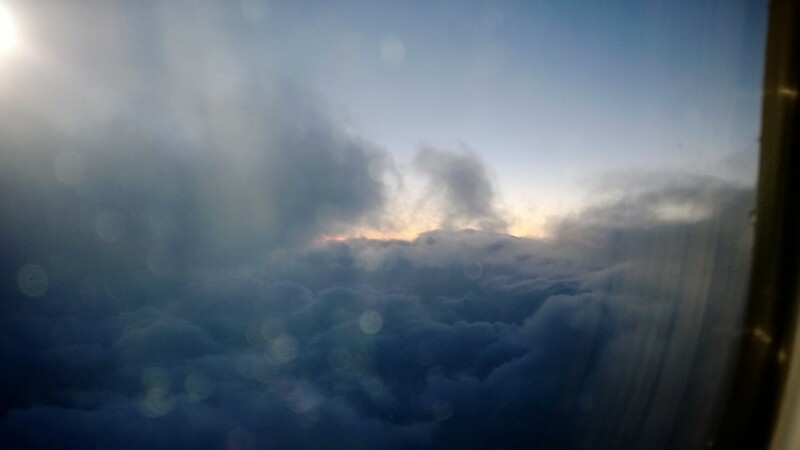 A couple days ago, I ha the opportunity to take some pictures from the air. The view was stunning, and I’m so glad I got that opportunity. 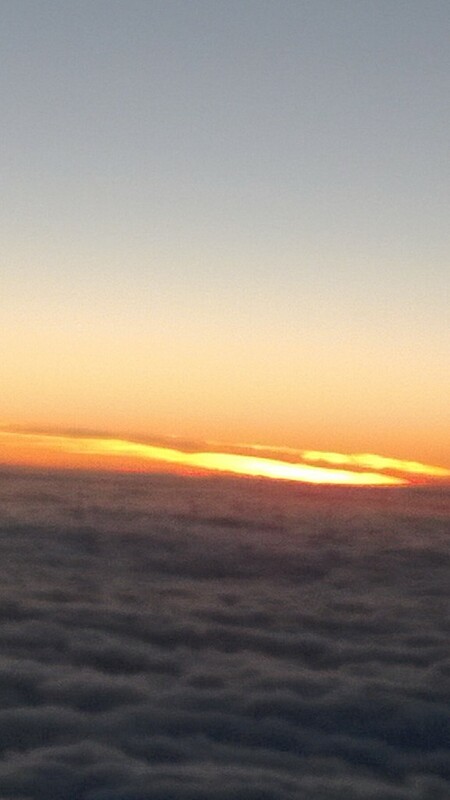 Doesn’t it look like the sun is sinking into a sea of clouds? My apologies for the graininess. But as with the photo a couple of nights ago, this was just a cellphone picture. Not bad for phone technology, don’t you agree? This entry was posted in clouds, real world, Webmaster and tagged clouds, real world, webmaster on November 25, 2013 by Webmaster. Greetings, readers! Happy Sunday to you! I recently came across a rather remarkable article and sound. Someone took the sound of cricket chirps, and slowed it down to the same relative speed as if crickets lived to be the same age as humans. I only listened to a part of it, but it was a fascinating sound! It makes me wonder what other high-pitched noises insects make that would sound surrealistic if we could hear them in the same relative time. It also makes me wonder what crickets think of humans, and the noises they make. What about you? Does this raise any puzzles for you, readers? This entry was posted in Uncategorized on November 24, 2013 by Fluffy McGiggles. I was just looking at my numbers of posts… Apparently, this is number 300. Can you believe it? 300 daily fluffs! That’s a bit less than ten months of daily posting. A lot has happened since then, hasn’t it? In fact, I think that’s what I’m going to do today. I’m going to look back at some of my favorite posts from each month that I’ve been posting! January’s Post: Well, I was definitely new to this whole Daily Fluff thing. I was, and still am, trying to figure out exactly what to put there. I have to say, Fluffy’s short story about the origin of treasure chests was an interesting post. It’s not a short story! It’s a legend! My posts in February: This was the first full month that I blogged. I’m just as glad it wasn’t a leap-year, or I’d have needed to write an extra one! I think my favorite post would definitely have to be Muffin Flavored Shrimp. I’ve used that question as a frequent opener since then! Favorite March Post: I’m actually going to cheat, and post two of my favorites. The first is one of my favorites because of the YouTube video embedded in it, not because of my commentary. It’s the video of Sheep LED Art. It’s totally worth watching. The second is my “book review” of an instruction manual. That one still gets its value primarily of a secondary source, but I still like it. April’s Post: My favorite would have to be my Foundation of Rome post. I got a fair number of hits, for like the first time ever, AND it’s an INFOGRAPHIC! May: Oh, gosh. I’d totally forgotten about May’s “comfort” challenge. That was probably one of my least intelligent decisions with this blog… But I’d have to say that my “breathing” post is fun. I’m often a bit amused when I go back and look at my various numbering systems. June: I think my instructions for how to make a room messy in seven easy steps mostly qualifies. I also like my post about the random pair of socks. So I’ll just list those both. July: Again, I’m going to cheat and post more than one. If I had to choose, I’d probably go with my post on how books are like an addictive substance. But my post about the origin of the use of aloe also amuses me. Is it bad that I’m amused by my own work? August: I think that my post about what to do with freshly baked cookies is one that I really like. September: Definitely my post about Lemon Dessert. I still think about that one fondly… Maybe some day, I’ll redo the video and add sound effects. And finally, October: I think my poetry about coffee should qualify as one of my best posts of the month. Thank you all for reading my 300 posts to date, and here’s to even MORE! Enjoy the rest of your week! This entry was posted in list, Webmaster and tagged list, webmaster on November 23, 2013 by Webmaster. Greetings, Fluffsters! HAPPY FRIDAY! It’s the weekend. And less than one week until Thanksgiving! It’s also the time that a lot of things happen. This can be the start, or continuation, of one of the most stressful times of the year. Because of that, I’m going to share four great de-stressers with you. I may have talked about them already, but oh well. They’re worth being repeated. 1) Spinning. This can be any of the forms of spinning you can think of. I personally do the kind with wool, primarily. There is something very soothing about creating yarn from fibers. On the other hand, taking time to just spin around in circles can also be a lot of fun. I also understand that a lot of people find exercise to be anti-stressifying. Whatever the form, spinning can be great for relieving stress. b) Silly Putty. I haven’t mentioned my glow in the dark silly putty recently enough. It is amazing stuff. Especially if you have enough, putty of that sort can do wonders for reducing stress. Squeeze it, stretch it, snap it, sculpt it- it’s both a creative outlet and a physical calmer. iii) Listening ears / ranting. Talking about what’s going on in your life that’s stressing you can be very helpful. Especially if the person can give you advice or words of encouragement. Don’t underestimate this option! Last) Hugs. Hugs are good. I would like to say they can make practically anything better. My advice: Find an excellent hugger. Get to know that person really well. They’re amazing, and if they like giving hugs, that’s the best. There you go, Fluffsters! I hope this helps if you have a busy time ahead of you. This entry was posted in list, real world, Webmaster and tagged list, real world, webmaster on November 22, 2013 by Webmaster. Last night was perfect. Not so much the activities, since I was feeling grumpy for a large part of it, but after I finished an activity, I walked outside, and it was amazing. And actually, part of the light pollution was part of the perfectness itself. The moon was so bright it outshone some of the lamps! It was stunning. The stars were out, too, as usual. But this time I could actually see them! Yes, there was light pollution. But it was low enough that I could mostly blot it out by lifting a hand. The weather was also perfect. It was just above freezing- crisp, cold enough to keep a lot of the less crazy people inside (and therefore keep things quiet), and all in all wonderful. I spent about a half-hour outside just staring at the sky. During that time, I not only saw a flock of migrating geese (at night! SO COOL!) but I also saw TWO shooting stars. One of them was really bright, and lasted for probably three times as long as most of the others I’ve seen in my life! Did I mention it was really bright, too? Creeky reflections. 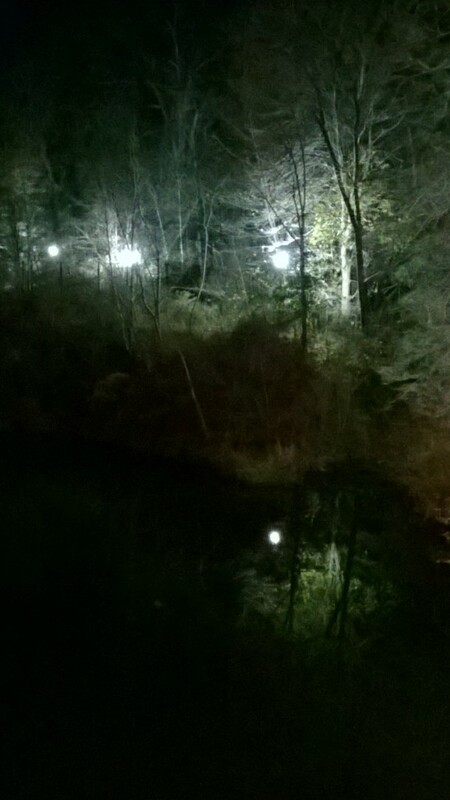 As in, reflections in a creek. I love reflections. I love night time. I love the interplay of light and dark. And I have decided I really like my phone. Oh. Right. You see, I got that picture just with my phone. No tripod, no flash, no fancy devices. Just handheld technology. Well, have a great day, Fluffsters! I hope you have as amazing a day as I did a night. This entry was posted in nature, real world, Webmaster and tagged nature, real world, webmaster on November 21, 2013 by Webmaster.